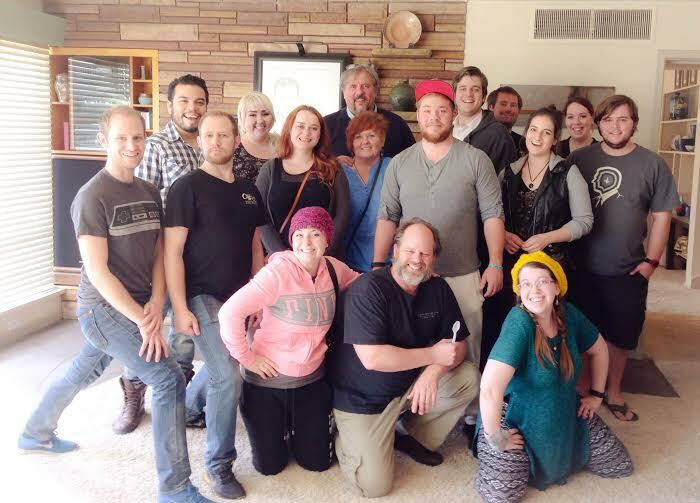 ST. GEORGE – Dixie State University students and alumni are clamoring for the reinstatement of former theater arts professor Varlo Davenport, who was terminated in December 2014 after a student accused him of physically assaulting her during a classroom acting exercise. Those present in the class and theater professionals have since affirmed the exercise as a normal and accepted method of instruction in an acting class. The family of the student involved in the incident filed a complaint with campus police and are asking for criminal charges to be brought against the professor. The Washington County Attorney’s Office is currently reviewing the complaint to see if it merits the filing of criminal charges. “I’m reviewing it to determine if there has been a law broken,” Deputy County Attorney Jerry Jaeger said, noting that the review process can take up to two weeks and reiterating that at this point his office is only reviewing the complaint. Davenport said the exercise that ultimately got him fired was an accepted and oft-used method of instruction to help an acting student overcome emotional barriers in her performance. “It is normal pedagogy in an acting class,” he said. The day the incident occurred, Davenport said, he was working with the student and her male scene partner in front of the class, trying to help her connect emotionally to the scene. “And we just weren’t making any progress,” he said, describing the scene as one involving a woman who’s dealing with a relative who is a drug addict. He said he tried a variety of approaches to help the student connect to the action taking place in the scene. He tried asking her to inject her own perspective into the scene and imagine scenarios she could personally relate to in order to tap into the needed emotion; he tried taking the class outside so she and her partner could stand 50 yards apart and perform the scene that way, to get her to project her voice and also better emote; he tried having other students stand around the girl and annoy her in various ways – such as poking her and tossing her hair in her face – to help evoke the emotion of anger and frustration needed in the scene; and, finally, he said, he stepped in himself when nothing else was working and commenced flipping the girl’s hair and nudging her as her fellow students had previously done. Lizzy Peterson, wife of DSU music professor Ken Peterson and a current student at Dixie State, was present in the classroom when the exercise took place. She said no matter what Davenport tried or said, the student continued delivering her lines in a quiet voice and did not follow his instructions or respond to his efforts to help her connect to the scene and interact with her partner. He (Davenport) asked her if she wanted the two classmates to stop and she shrugged her shoulders. Varlo asked the two students (who had been bothering her) to sit down and told (her) to start the lines again and pretend like those two students were annoying her and she wanted them to stop. After this attempt of (she and her partner) doing their scene exactly the same, Varlo stood behind (her) and started flipping her hair and nudging her in the same fashion as the previous two students had done. Varlo then asked (her) if she felt annoyed and she said ‘No’. The class started laughing and one student made a comment on how resilient (she) was. Varlo then flipped her shirt sleeve in an attempt to evoke a response. In a further attempt to evoke a response, he held her to the back of her chair by her shoulders and started flipping her hair again. He tilted (her) chair and asked her if she was annoyed to which she responded ‘No’. He put her chair on all fours and held her by the shoulders and told her to start her lines. They, (she and her partner), started the lines again with still no change. Varlo stopped them a few lines into their scene and asked (her) if she was annoyed and she said ‘Kinda’. So Varlo stopped working with her and told them to start the scene, again. (She) then said ‘but I am not really annoyed’. So Varlo started messing with her hair again and said ‘all you have to do is tell me you are annoyed and I will stop. Are you feeling annoyed?’. (Her) response was ‘Yeah, Kinda’ so Varlo sat down and said ‘OK, now do the scene as if I was annoying you and you wanted me to stop’. (Her) response was ‘I’m not actually annoyed though’. Varlo told her to try and pretend to get annoyed. Davenport said his students are reminded throughout the semester to say “stop” if they want an exercise to stop for any reason. That particular student never asked for the exercises to stop or expressed discomfort the day the incident occurred, he said. Peterson said she and a classmate were frustrated that the entire class period had to be spent on one student who wasn’t prepared and had missed a lot of school. She recalls walking with another student past a group of classmates who were, she said, “offering positive reinforcements” to the girl about the work that had been done during the class period. Davenport said he doesn’t remember the student being upset, recalling it as another workday with students in an acting class. After the class in question, school broke for Thanksgiving. Shortly after the semester resumed, school officials pulled Davenport from class, advising him an assault charge had been filed against him and that he was dismissed. After Davenport’s termination from DSU, current and former students began demanding their professor be reinstated. DSU students and alumni have held rallies – including staging a sit-in at a DSU faculty review hearing held for the tenured professor after his termination – and launched a petition urging the university to restore him to his position as an instructor. As of Friday night, the online petition created by Davenport’s supporters had amassed more than 1,300 signatures and statements of support from many of his current and former students and their parents, professional peers and local community members. When I was a brand new professor at DSU Varlo mentored me when the Dept. Chair … didnt give me the time of day. Varlo was always available for my questions. He is one of the most respected theatre artists in the state. As a high school drama teacher, I will no longer send my students to Dixie. … I firmly believe that an acting teacher’s objective is to help his/her students reach that level of truth in their class projects and performances. Once reached, students experience a creative freedom and ‘high’ because they are no longer trapped by ‘walls’ that limit their performance abilities. As an acting student, Varlo got me performing truthfully by directly employing a variety of emotional, physical and interactive exercises in class. Varlo did this when he recognized the ‘wall of fear’ I put up and how it blocked my ability to progress and produce an organic response. I. L.O.V.E.D I.T! It released me from everything that held me back in my art. I felt safe, I felt challenged and I felt that every minute he gave me turned into a valuable experience. In a termination letter sent to Davenport, his daughter Hannah Davenport said, he was told his paycheck issued at the end of February would be his last. He received no severance pay. An employee is to be sent a copy of any derogatory or negative information by its originator, before it is placed in his/her file. Varlo Davenport said he did not receive anything in writing prior to his sudden verbal termination; and Hannah Davenport said her dad was not initially told the exact nature of the complaint against him. In his 15 years as a professor at the university, Varlo Davenport said, he has had disagreements with other faculty members at times, but there have never been any previous student complaints that he was ever made aware of. Hannah Davenport said her family was left to speculate after her father’s sudden firing. He was told he couldn’t return to campus, she said. Varlo Davenport jumped through the required hoops to have a faculty review hearing scheduled regarding his termination. The hearing took place Jan. 29 – almost two months after his firing. “I had five students from the class who were there who testified before the faculty review board, who said that nothing assaultive happened,” Varlo Davenport said. Former students also sent letters to the university on his behalf, and theater professionals from around the state and country wrote letters to the university asserting that the exercise in question was a standard technique used in acting instruction. Dixie State University President Richard “Biff” Williams was not in attendance at Varlo Davenport’s hearing. In fact, Varlo Davenport said, he has never once formally spoken with Williams since Williams was appointed president of the university in July 2014. The panel of faculty members appointed to review Varlo Davenport’s case ultimately exonerated the professor and recommended that he be restored to his teaching position. However, Williams chose to disregard the review board’s recommendation and uphold Varlo Davenport’s termination. Request the FRB to reconvene and issue a second recommendation. Reject the FRB’s recommendation because the Board’s findings were contrary to the information presented. After a thorough review I have elected to reject the FRB’s recommendation. This letter is to notify you that your original letter from Dr. Bill Christensen, dated December 5, 2014 regarding your notice of dismissal and termination of your employment, is upheld. Varlo Davenport was further instructed in the letter that he would need to make an appointment with campus police to be escorted to his office to collect his belongings. Historically, Varlo Davenport said, when there has been an issue involving an employee at the university, Dixie State’s practice has been to save the faculty member if there is any way to do it. “The idea was, at Dixie State, you don’t go straight for the nuclear option,” he said. Varlo Davenport said he is unlikely to find new work teaching theater in the midst of the allegations and his subsequent termination – but further, he has been left waiting and wondering if officers will be showing up at his home to arrest him. Professor Davenport was given full due process afforded by Dixie State University policy and procedure. His alleged misconduct and related information were fully vetted by a DSU faculty review board. Although the board recommended Professor Davenport’s reinstatement, I determined that the board’s position was contrary to the information presented. I understand that a criminal investigation is currently being conducted by local law enforcement. Dixie State University declines further comment until the investigation is completed. DSU declined to release any additional information or comment regarding the proceedings against Varlo Davenport in response to St. George News request under the Government Records Access Management Act. In the wake of this announcement regarding a criminal investigation, Varlo Davenport said, he received an anonymous email warning him that he was going to be criminally charged for “having an affair with an underage student.” That has turned out to be false. The “criminal investigation … currently being conducted by local law enforcement” that Williams alluded to, originated, in fact, with DSU’s own campus police department not the St. George Police Department. The DSU public relations office confirmed in an email to St. George News that the complaint filed against Varlo Davenport, which is now being reviewed by the Washington County Attorney’s Office, was lodged by the parents of the same student who was involved in the classroom incident that took place in November. In the months since his firing and throughout the appeal process, Varlo Davenport said, he’s tried to keep the focus on his interaction with his class and whether he can justify what he did – not on the student who lodged the complaint against him or on any other individual. The 15-year tenured professor’s sudden termination has some DSU professors now fearing for their own jobs. “I mean, there are a lot of very stressed, very concerned faculty members on campus who don’t want to lose their jobs,” he added. As this report is published, Dixie State University officials have declined to produce certain records requested by St. George News under the Government Records Access Management Act, including those pertaining to the complaint brought against Varlo Davenport and his subsequent review hearing. Ed. note: The author was a student of Varlo Davenport’s, having taken one class of his at Dixie State about 14 years ago; she has not joined in advocating for or against him in this matter. Ed. note Feb. 14, 2016: Minor formatting and style edits made for clarity in light of website formatting upgrades. The first question needing to be asked here is whether or not he’s an active and paying member in “the one true church”, and if so, what is his leadership status, has he always been current on tithing, has he always kept a recommend, has he always faithfully executed his callings etc etc. another thing to keep in mind is the political trend of colleges doing away with tenured positions completely. Last question to be asked: does this man have a history of fondling the female students? and did he fondle and assault this student? Why? Because I’m still in awe of the giant LDS chip on your shoulder. I’m sorry you didn’t and/or don’t get along with current LDS leaders, (local or otherwise) your Mom and Dad, or perhaps someone else. I understand – I really do. But wait, I must answer your last question: According to the article, which you apparently didn’t read, a claim of nothing in his personnel file was disclosed. So I’m guessing no, a history of fondling doesn’t exist. However, (If you had read the article) you’d know that the details of the alleged assault charges can not be commented on. I’m pretty sure that’s what the Attorney was quoted as saying. If you need me to read anything else to/for you, just let me know. I’m here to help. First: I have to say…priceless comment. Love it. Second : You are right, there is a giant sized CHIP because I just looked over most of the articles with comments and there seems to be a long strain of “mormon” this or “LDS” that and it is really getting old. It’s the same old people spewing the same old thing, hating on a demographic and not bringing anything new to the table. They are so absorbed with hating the populous that most of the time it has nothing to do with the article. Sad . If things happened the way witnesses reported, this girl and her parents need to get a life. If the girl is training in acting, she should expect to be touched. What is acting without touch? It’s not like he groped her or punched her. Crazy parents with an emotionally immature daughter, I expect. If you don’t like how the acting teacher at DSU instructed your daughter, send her to another college. Sheesh. This whole thing seems ridiculous. Maybe this girl isn’t cut out for acting, or maybe she’s having her Oscar moment right now.